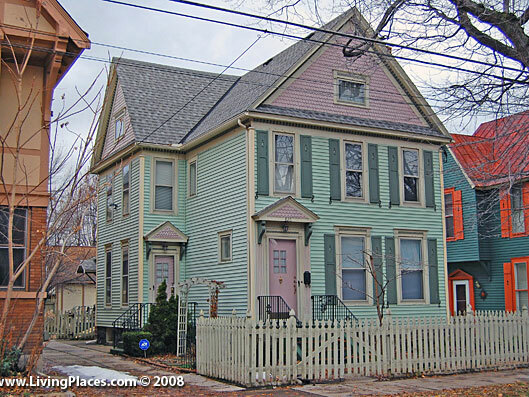 Photo: House on Cherry Street, City of Erie. Erie County Courthouse is located at 140 West Sixth Street, Erie PA 16501; phone: 814-451-6334. Erie County, formed March 12, 1800; named for Lake Erie, the name Erie from a tribe of Indians, Eries, conquered by the Iroquois Confederacy in 1653, their identity and language is lost; curious mounds and circular embankments, still found in several places, show traces of a race superior to the Indians; human bones in large quantities have been unearthed on line of the Pennsylvania and Erie Railroad, indicating huge physical development, one was nine feet in height. The triangle north of Pennsylvania and west of New York was purchased, by authority of Governor Mifflin, in 1791, from the United States, to obtain a lake port for the state; conveyance being signed by President Washington and Thomas Jefferson, Secretary of State; afterwards the Indian title was purchased from the Six Nations, through the diplomacy of Cornplanter (Gyantwachia), the Seneca chief, for which the state gave him a reservation in Warren County; later the Indians resolved to prevent the settlement of Presque Isle by Americans, but General Wayne gained a decisive and final victory against them in the battle of "Fallen Timbers" on Maumee Road in 1794. The Shore belt, for ten miles in width, is noted for grape and fruit raising; back of this is a productive agricultural section. Iron and steel industries predominate. Principal roads are along the south shore of Lake Erie, called the East and West Lake Roads, that form a fifty-mile section of the international touring route across the continent. The old French Road from Erie southeast to Waterford, 18 miles, was originally part of the stage route between Pittsburgh and Erie, and also the old portage route from Lake Erie, for military and commercial purposes, to the head waters of the Allegheny River navigation, at Fort Le Boeuf, Waterford, on Lake Le Boeuf. In 1753, Major George Washington, twenty-one years old, first caught the attention of mankind; he came with a message from Governor Dinwiddie of Virginia, to notify the French to discontinue fortifying Presque Isle and Le Boeuf, claiming them to be British territory. Captain Riparti came from Presque Isle for the conference. Washington was accompanied by Christopher Gist (White) and an Indian interpreter. They were in Fort Le Boeuf from December 11-16, and treated courteously by the French officers, who stated they would communicate with their superior officer, Marquis Du Quesne, but at present must refuse to comply. Erie, county seat, population 93,372, on site of Presque Isle Fort, built by the Marquis Du Quesne in 1753; one of the chain of thirteen French forts extending from Quebec to Fort Du Quesne; is 35 feet above the lake, 573 feet above sea level. Surveyed by Andrew Ellicott, in 1795, first Surveyor General of the United States, three public parks of five acres each were in the original plan, along Sixth street, one mile apart. Perry Square, Sixth and State Streets, on original plan, is focus of public life, it contains memorial monuments to Captain Charles V. Gridley, bronze statue, erected in 1913, commander of the flagship of Admiral Dewey's Squadron, in Manila Bay; Eben Brewer, bronze statue, first American postmaster in Cuba; General Anthony Wayne, large granite boulder surmounted by two cannon, erected, 1902; and bronze statue to Civil War soldiers, erected, 1872. Courthouse, facing Perry Square, classic, Corinthian columns, native stone, erected in 1852, the bell is a trophy of war, from the British battleship Queen Charlotte, in 1813; court room contains complete representation of portraits of Erie County judges. Public Library, South Perry Square, Italian Renaissance, granite, built in 1897, architects, Alden & Harlow, Pittsburgh, contains portraits of Commodore Perry, General Anthony Wayne, Captain Charles V. Gridley, President Lincoln; in the Art Gallery is a small permanent collection of works by American artists, among those represented are Childe Hassam, R. M. Shurtleff, F. S. Church, George R. Barse, Arthur Parton, H. Bolton Jones, Charles A. Hulbert, and Henry Mosler; annual art exhibitions are held here by the Erie Art Club. The Library also has a museum, with relics of the French and Indian, the Revolutionary War, the War of 1812, and later wars. Erie has a conservatory of music, with an organized symphony orchestra, and glee club. The old Custom House, State Street, north of Perry Square, built in 1837, classic, brick with white marble steps and Doric columns, was first used as a United States bank, now in possession of the Grand Army of the Republic. Erie has fifty-five churches, eighteen missions, and other religious societies, also two cathedrals. St. Paul's, Protestant Episcopal, West Sixth Street, Gothic, stone, built, 1866, architect, St. John of Detroit, rose window by Tiffany, who also made some of the memorial windows; St. Peter's Roman Catholic, Tenth and Sassafras Streets, Gothic; Medina New York red sandstone, trimmed with white sandstone from Amherst, Ohio, and Mercer County, Pennsylvania, built in 1893, architect, C. C. Keely, New York; contains statues of St. Peter and St. Paul, Carrara marble, made in Italy; stations and stained glass windows from Munich, Germany; other windows made in this country. Memorial windows are also in the First Presbyterian Church; St. Mary's and St. John Kanty (Polish). The State Soldiers and Sailors' Home and Marine Hospital, built, 1867-68, brick and stone, is located on the lake front; on the grounds is a replica of the original blockhouse fort, where General Anthony Wayne died in 1796, after his conquest of the Northwest in 1795; he was buried here, until his body was removed in 1809 to St, David's burial ground, Radnor. The blockhouse, showing plan of construction, was built in 1880, as memorial to General Wayne, it contains relics, and part of coffin lid with his inscription; these grounds were the reservation, on old City Plan of 1795, set apart for fortifications, in the most commanding position, for protection to entrance of harbor. Most of the military history of Erie is interwoven with the location between Parade and Wayne Streets, north of Fifth Street; here was the first white settlement, Presque Isle Village, and French fort in 1753. On bluff near Parade Street, blockhouses were erected, 1753-96-1813. Parade Street formed part of the old French road to Fort Le Boeuf, French garrison, 1753-59; English 1760-63, and in 1785 American 1795-1806, also 1812-13. Here in 1763 took place the hard fought two days' battle of Presque Isle, with Pontiac, chief of the Ottawas, who, with a vast force, simultaneously attacked all thirteen forts, and captured nine of them, including Presque Isle and Le Boeuf, and again this was the objective point of the Indians in 1794, when they were finally conquered by General Wayne. Here Thomas Rees, first justice of peace, entertained in his tent at the mouth of Mill Creek, a French exile, the Duke de Chartres, subsequently Louis Philippe, king of France. At the foot of Peach and of Cascade Streets, granite blocks, with brass markers, note approximate positions where Commodore Oliver Hazard Perry's ships were built, on which he won the victory of the "Battle of Lake Erie," in 1813. The powder used to fight that battle was made at Du Pont's, Wilmington, Delaware, and brought through Pennsylvania in Conestoga wagons. The second flagship of his fleet, the Niagara,is in Erie Harbor, having been raised from the sand of Misery Bay, where it lay for nearly a century; it was rebuilt by the state at a cost of $75,000 for the Perry Centennial in 1913; the first flagship, Lawrence, was raised and rebuilt for the Centennial Exposition in Philadelphia, in 1876; also in Erie harbor is the United States warship Michigan, now named Wolverine and used as a naval militia training ship; built in 1844, it was the first iron warship, and brought to Erie in sections from Pittsburgh; the original engine is still intact and seaworthy; now oldest ironclad vessel in the world. At foot of French Street, Commodore Perry's fleet landed with the captured British squadron. This place was camping ground of the Pennsylvania militia; in War of 1812-13, the British fleet was drawn up in front of the harbor, to destroy Perry's vessels while under construction; Captain Daniel Dobbins of Erie, commander of the Ohio, was the guiding spirit in building the fleet; 2500 soldiers encamped here, with cannon mounted, and such military preparedness as to forebode disaster to an enemy attempting entrance to the harbor. General Lafayette visited Erie in 1825, and a banquet was given him. The Presque Isle peninsula, surrounding Erie harbor, has a state park, of more than 1500 acres, which is free to all; it gives Erie a large and thoroughly protected harbor; 100 acres were reserved for United States fortifications and dockyards; a life-saving station here, established in 1876, is place of interest. Presque Isle Bay is the finest natural harbor on the Great Lakes, four and one-half miles long, one and one-half miles wide. Lakeside Park, an irregular and sloping strip of land along the water front, from Mill Creek on east, to City line west, sixty-five acres, was laid out in 1888 by John L. Cully, landscape engineer; other open spaces are the Waterworks Park; the Reservoir; Erie, Trinity and Lakeside Cemeteries. Present city planner is John Nolan, of Massachusetts. Erie has also twenty smaller parks, of these the largest are Glen-wood, between Sassafras and Cherry Streets, purchased by Erie Public Park Association in 1903, 114 acres, a natural forest with large stream of clear water and swimming pool; the Fish Hatchery, Twenty-third and Sassafras Streets, one of the most important in the state; Waldamere, four miles west on Lake Erie, and the State Normal School Grounds at Edinboro, sixteen miles south of Erie.